Looking for the perfect Kayaking Helmets? 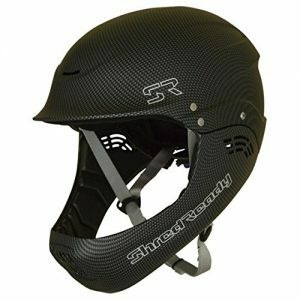 We have a wide selection of helmets from brands such as NRS, WRSI, Sweet Protection, Shred Ready, & more. Whitewater rafting & kayaking are popular sports but requires you to take proper safety precautions before your weekend on the water. Our kayaking helmets will protect you from unexpected impacts while out on the moving water & help you have confidence for your journey. Several of our helmets offer a laminated carbon fiber thermoplastic for the best elasticity, rigidity & strength for maximum protection. Match that with Coolmax technology for better wicking capabilities will ensure you can focus on having fun instead of your worrying about your helmet. We integrated Amazon reviews within our site so you can research & be informed about the best kayaking helmets on the market. If for some reason you do not see a particular helmet, please send us a Facebook message so we can add it for you. ABS injection molded shell. Certified CE 1385 international standard for headgear for whitewater sports. Multi-Impact VN foam liner laminated to closed-cell comfort foam.